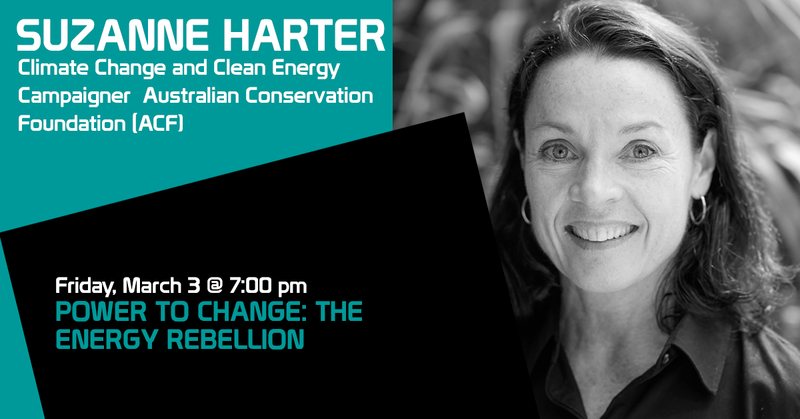 Suzanne is currently a climate change and clean energy campaigner at the Australian Conservation Foundation. Her childhood was spent in Hawaii (a state which recently legislated to achieve 100 per cent renewable energy by 2045). She has an International Affairs degree from Lewis and Clark College in Oregon and a Masters of Public Administration from the Maxwell School of Citizenship and Public Affairs at Syracuse University. She spent about a decade in Washington DC working on the staff of the late Senator Edward Kennedy, and as a consultant for Project Performance Corporation focused on clean-up of US nuclear waste sites and facilities. After a stint working as an international adventure travel researcher and guide, she moved to Australia and spent the next 6 years working as a policy adviser for the current and previous South Australian Premiers (which included climate change and renewable energy). Suzanne now resides in Melbourne, is a nature enthusiast, and is keenly interested in seeing a clean energy transformation in Australia.